Chickpeas, also called garbanzo beans, are a staple ingredient in Middle Eastern cooking, partly because they are so versatile. If the idea of turning them into a sauce seems a little odd, consider that hummus is basically a thick chickpea sauce. And yes, hummus actually does taste good on pasta! 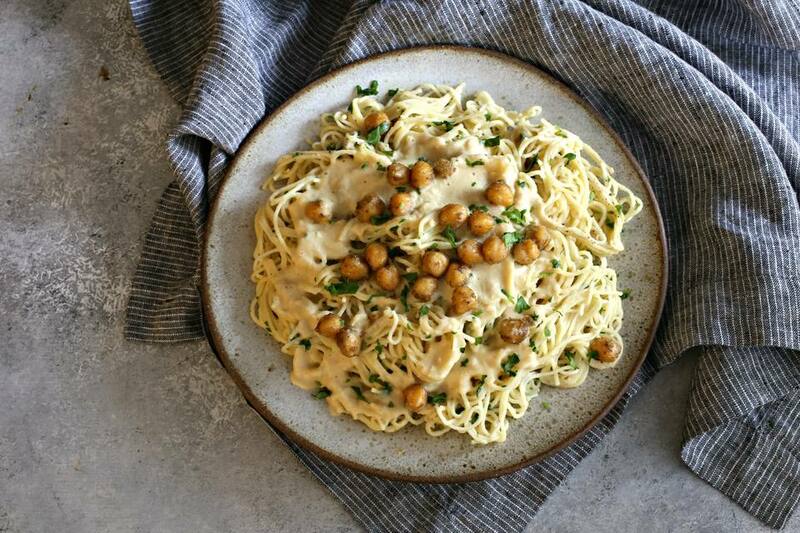 Topping pasta with a puréed bean sauce, whether you use chickpeas or white beans, is also a great way to remove the more traditional dairy from a sauce, whether you're eliminating lactose intolerance or following a vegan diet. Chickpeas are fairly mild in flavor, but make an excellent canvas for a wide variety of spices. Cumin is one of the more traditional matches, but feel free to experiment with smoked paprika or curry powder, perhaps even a touch of cinnamon. And while the recipe works great with canned chickpeas, particularly because it is quick and easy to make on busy weeknights, it will be even more delicious if you start with dried beans. For the quick soak method, place the dried beans in a large pot of water, bring to a boil, remove from the heat, and let stand for one hour. Then drain the beans and proceed with the recipe as if they were canned. The result will be creamier beans and a creamier sauce just like starting with dried beans results in a creamier hummus. Whichever method you choose, this nutritious bean sauce will become a staple on your menu. Heat one tablespoon of the olive oil in a large skillet or cast-iron pan. Add the ground cumin and ground coriander and cook for one minute on high heat, stirring occasionally to prevent burning. Add the rinsed and drained chickpeas to the pan, along with the salt, black pepper, garlic powder, and red pepper flakes (if using). Continue cooking on high heat for about 5 minutes until the chickpeas begin to lightly brown. Remove all but about 1/4 cup of the chickpeas to a blender. Bring a large pot of salted water to a boil, and add the angel hair pasta. Cook according to package directions. Before removing from the heat, ladle a cup of the pasta water into the blender with the chickpeas. Drain the pasta, and add to the pan with the remaining chickpeas. Toss to combine. Add the second tablespoon of olive oil to the blender with the chickpeas and pasta water and purée until smooth. Check the seasoning and add additional salt, if needed. Pour the chickpea sauce over the pasta and stir in the parsley. Top with a squeeze of fresh lemon juice, and serve hot. Note that you can substitute any pasta you like for the angel hair and follow package directions for cooking times.